Developer: Matthew Smith. Released: 1984. Other versions: AMI; C64; SPC; PC. 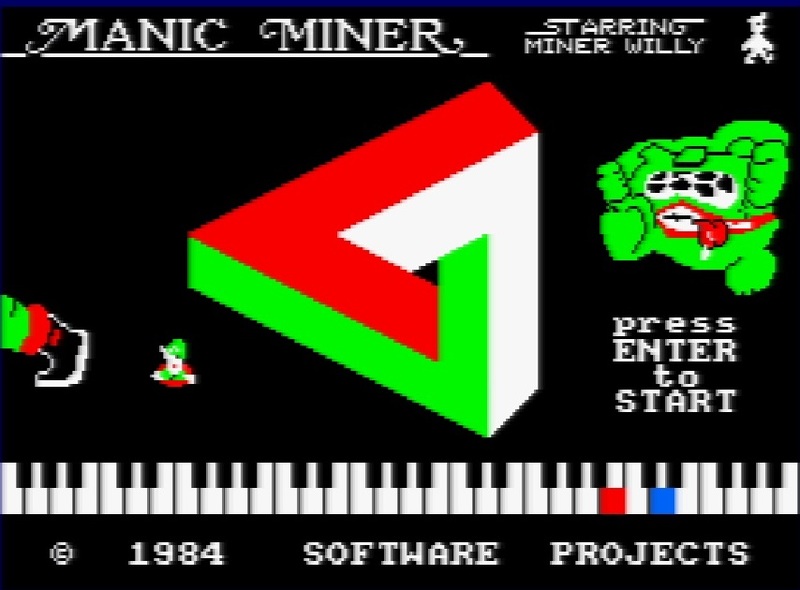 Demonstrating some key advancements of video game development, the often unsung Manic Miner was the first outing for Miner Willy in the early 8-bit era, a game which led to three successful sequels in the mid-eighties including the more well-known Jet Set Willy. Based on the previous Atari title Miner 2049er and designed originally for the ZX Spectrum by independent developer Matthew Smith, this challenging single-screen platformer featured excellent playability, zany enemies and more importantly, in-game BGM. The modern gamer may scoff, but in 1983 this was a major breakthrough for home video gaming. 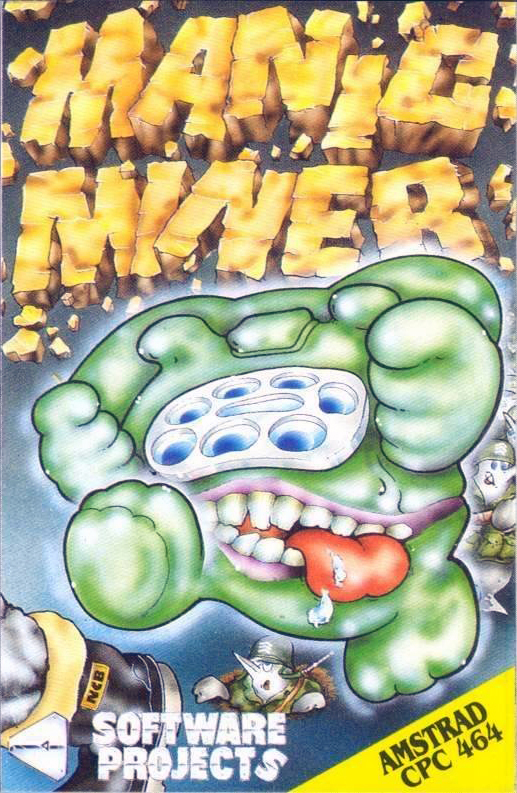 Needless to say, Manic Miner is now considered a true classic having been ported to many systems over the years, including the Game Boy Advance and even the Xbox 360. Homebrew adaptations have also been doing the rounds for years over the interweb, so let’s return to one of the very first incarnations on the CPC and see what made this game the historical mining marvel that it is. The object of Manic Miner is simple on paper; navigate the 20 caverns of the mine, collecting the keys in each to unlock the exit to the next. This is accomplished by pixel-perfect jumping, and that’s it. Miner Willy can’t shoot things, power up, run or do a dance, it’s all about patience, planning and expert leaping dexterity. Each cavern is a different layout of platforms which are filled with various hazards ranging from deadly plants to the wackiest of wacky monsters. We have to contend with living toilets, sentient eyeballs and mutant killer telephones! Not to mention the many recognisable characters lifted from previous games such as Pacman and Donkey Kong. It’s a game that only works as well as it does in the single screen format, but the variety and progressiveness of each level is excellently arranged, and provides a steep difficulty curve which can be very harsh. To complete the game, a perfect execution of all 20 caverns is required, and this is not an easy task. Visually, it’s not a massively impressive game, but there are some neat notes. An early title for the CPC, it’s very reminiscent of some Atari titles of the previous decade except for a finer resolution and less jerky movements. 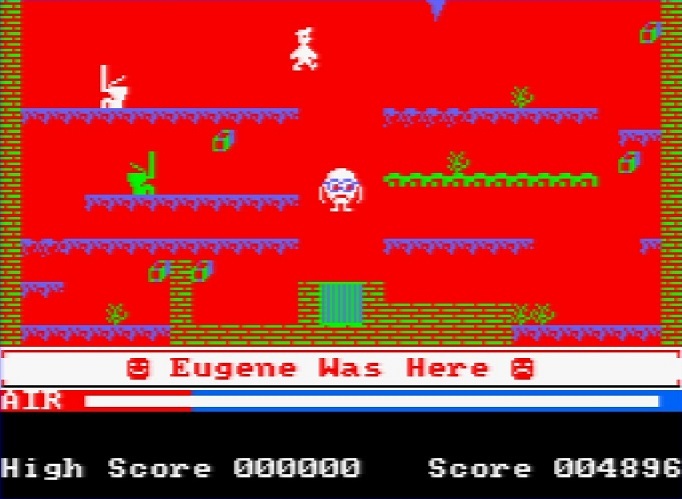 The 4-colour scheme is used shrewdly, giving the impression of more colours on screen, and each enemy, platform and exit never clash. A few bits of simple supporting animation help matters, as does some slight texturing, both adequately implemented. Even with the more complex levels such as the warehouse or skylap landing bay, slow-down is barely present and everything runs smoothly. Detailing could have been better, the primary sprite can get lost on overlaps and the giant solid borders can be off-putting. More essentially, the collision detection with the platforms is faultless, as has to be given the nature of getting the jumps performed perfectly to progress. This accuracy doesn’t extend to the hazards, in which the detection can be questionable. What makes things more distinctive are the mad forms said enemies take. Aside from the ones already mentioned, we also have performing circus seals, bouncing bank cards, rats, penguins and other, more random and indiscernible things. It’s all fun to watch, and along with the many homage’s to prior famed games, topped off by the comical Monty Python-esque squashing foot Game Over screen. Is that Santa Claus sneaking out of shot? For a game lauded for its audio advancements, it doesn’t really come across that obviously on the CPC. SFX or BGM options can be selected in-game, and while amusing at first, the effervescent and incessant tones of ‘Hall of the Mountain King’ can become maddening. For a bit of variety, there is a nice title music sequence which sets the playful mood well. Since there is not much to put sound effects too, the SFX that is present is decidedly minimal but does lay down the character of the Miner Willy series. It helps the gameplay too; the jumping effect is matched well with the action thus aiding judgment of positioning and proper execution. 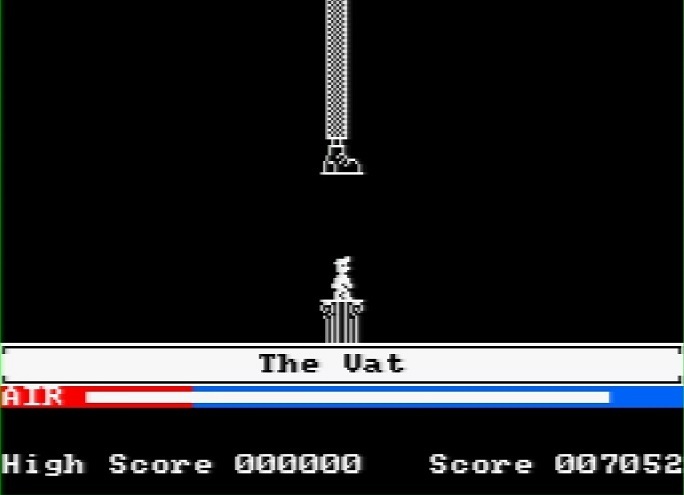 This is what makes Manic Miner very addictive and pleasing; the satisfaction of implementing a plan, hitting those tricky jumps and reaching the next cavern is very gratifying after umpteen attempts at trying to complete a particularly difficult stage, i.e. 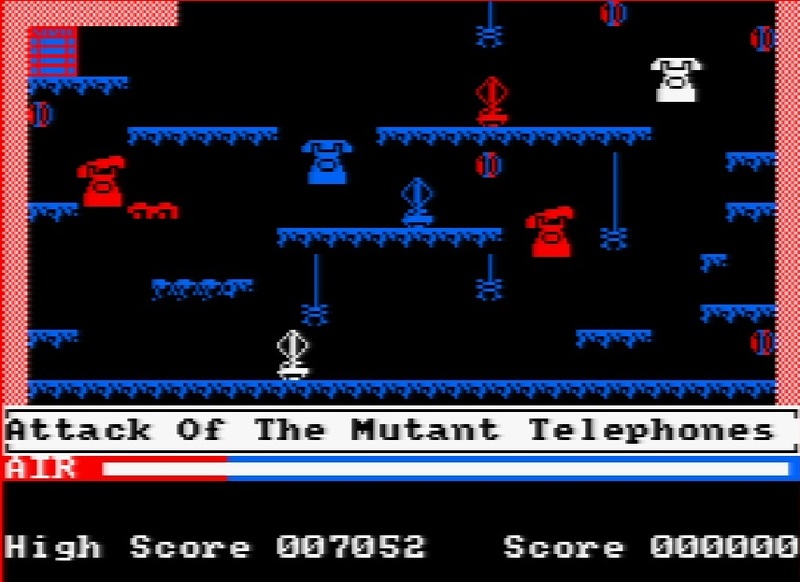 : Attack of Mutant Telephones! Because the game is so uncomplicated to control, it becomes second nature on how to plan ahead. This just works very well and at times can infringe into the puzzle genre. This basically brings it down to your problem solving skills and slight control of touch to get things right in one go. Manic Miner may not be the most complex or progressive game of its era, the innovations it’s known for are not all that relevant to this version, but what it does contain it exhibits well. Straightforward, addictive and happily frustrating gameplay, functional, neat and madcap graphics, memorable sounds and yet another example of a rock-hard 8-bit title, such is the mining-theme irony. Its continuing life on the modern systems and its still-strong fan following make it a game that won’t disappear any time soon. The Speccy made it famous, the CPC gives it a commendable depiction, but all versions have their charm due to the original blueprint. So pick up a copy and enjoy playing with your Miner Willy.